Please read the Welcome and Introduction section of the NGF forum when you Log In. This contains rules and tips for you about your account. We're a friendly bunch joined together with one hobby, so cliques and negativity towards other members are not welcome here. CHECK YOUR EMAIL ADDRESS! False email addresses are not permitted and may result in your account being closed. You will be sent a Private Message if your email address bounces. 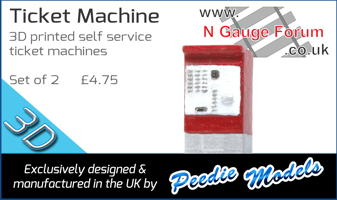 Advertising:- N Gauge businesses are welcome to advertise on the forum in return for a small monthly donation to the forums up keep. Please message an Admin or NGF staff member for details. Members who join to spam or place advertisements of their businesses will have their accounts suspended. Reviews:- All reviews on the forum are the opinions of the user who wrote it, and the N Gauge Forum is not responsible for those opinions. Cookies Policy:- A Cookie is a text-only string of information that passes to your computer through your web browser. It cannot be used to identify you personally. You can disable cookies on your browser, however you may find that it impairs your use of our web site. We also use third party cookies by using Google Analytics, Facebook and Flag counter. They collect anonymous information about our members/customers such as, where they are from, how long they stay on the site or how they found it. Again personal information is not obtained. You agree, through your use of this forum, that you will not post any material which is false, defamatory, inaccurate, abusive, vulgar, hateful, harassing, obscene, profane, sexually oriented, threatening, invasive of a person's privacy, adult material, or otherwise in violation of any UK, International or United States Federal law. You also agree not to post any copyrighted material unless you own the copyright or you have written consent from the owner of the copyrighted material. Spam, flooding, advertisements, chain letters, pyramid schemes, and solicitations are also forbidden on this forum - unless permission has been given by the forum owner.